MMKAC , with a team of some 120 athletes, opened their latest Chiltern Cross-Country League campaign at Keysoe, north of Bedford. Host club, Bedford & County AC, again just headed MMKAC for overall victory in Division One with Chiltern Harriers in third place. Some 311 men finished the senior mens’ race and here MK just beat their Bedfordshire rivals. They competed around a 3-lap totalling 10km course, mainly flat grassland but with a 20m wide water-splash to be negotiated on each circuit. The scoring ten were led home by Liam Smith and Steve Tuttle in 6th and 7th places respectively. Sam Winters came through strongly in the latter stages for 16th followed by Mark Palser (20th), Graham Jones (21st), Chris Hearn (24th) and Steve Green (28th). Chasing these were the Wheeler twins who have moved up from the M17 age group. George finished 34th and in a hectic sprint finish, Josh Lyman split the duo (35th) with Charles Wheeler two places down for 37th. Getting their scoring 10 in the top 37 is quite an achievement and augers well for the remainder of the season, especially as there are another six men who could feature at the sharp end. The Bedford ladies turned the tables on MMKAC with a narrow team win. Lara Bromilow finished 3rd and Elle Roche (10th), Nadine Lewycky (14th) and Martinha Ferreira (19th) comprised the scoring team who placed second. There were 14 local ladies running, their best for some years, and making the top 50 were Tanya Cronin (21st), Natasha Baker (27th), Gemma Childs (39th), Debra Brent (46th) and Mel Wright (48th). Best placed of the younger age groups was the under 15 boys who finished second with a great 4th place from Jack Meijer and backed up by Robert Hickman (9th), James Dowsett (11th) & Aaron Wootton (15th). The under 13 boys placed 3rd with Jack Sharp (14th), Aidan Murphy (15th), Ben Green (19th) and Kiylen Nurse (26th). Alfie Yabsley (6th) led the under 17s to another third team place with Dan Hynes (13th), Ewan Forsythe (15th) and Harvey Green (33rd) completing the team. From the younger female age groups the under17/20s and under 13’s placed third. The latter were headed by Barbara De Koning (5th), Charlotte Underwood (6th), Imogen King (20th) and Chloe Munroe (21st). Emma Mears moved up to the under 17/20 age group for this winter and was 5th overall but 3rd U17. Rhona Grant was 10th and 5th respectively and the team was completed by Sophie Botham(21/14) and Charlotte Moyse (22.15). The under15s were fourth team on the day with the foursome of Gemma Milne (14th), Enya Deyse l(16th), Holly Jamieson (18th) & Libby Herdman-Smith (20th). The League also encourages non-scoring races for under11’s and are enthusiastically competed. For the boys there were 70 finishers and the first three for MMKAC were Sebastian Henry (13th), Harry Rose (34th) and Kian Nicholson (41st). Sonja De Koning ran a fine race in the 63-strong girls race to finish 5th ahead of Daisy Yabsley (14th) and Annabel Sanders (16th). 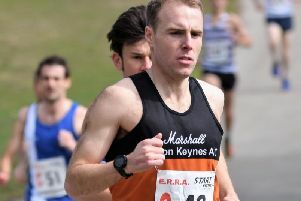 There were nine MMKAC runners competing in the Peterborough Half-Marathon where almost 4000 finished. Jonathan Peters led the club home, 22nd in 74.01. Jamie Seddon set a PB of 76.33 to place 51st followed by Dan Webber, 67th(77.54), Ian Lamb 131st(82.42), Mike Kerrigan 162nd (83.53) and Matt Child, 200th (85.52). Rachel Robinson placed 19th lady (219th overall) with a time of 86.25. Chris Dunn, 279th (88.38) followed with the squad completed by Peter Tye 2333rd (123.47) and Eddie Hill 2623rd (128.39).